Making granola is fun, simple and very easy. All you need are some oats and your favourite add-ins and voila - delicious granola. The recipe for toasted granola calls for oats, wheat germ, almonds and coconut to be tossed and toasted with honey with dried fruit being added in when it is finished. The thing I like about this recipe is that you don't toast the fruit. I've made other recipes where the raisins are put in the oven and come out bloated and burnt. Not yummy. This way you have perfectly chewy fruit and crunch oats. You can have the granola with some milk or yogurt for breakfast or use it in a recipe that calls for granola. I was going to do this but it all gone so I have to make a new batch. 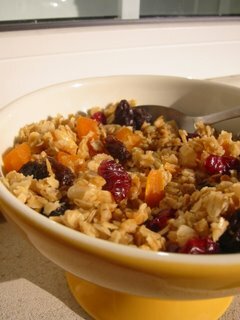 The granola is tasty, sweet and substantial and keeps you going those days you're to busy to eat. Try it, you might like it. 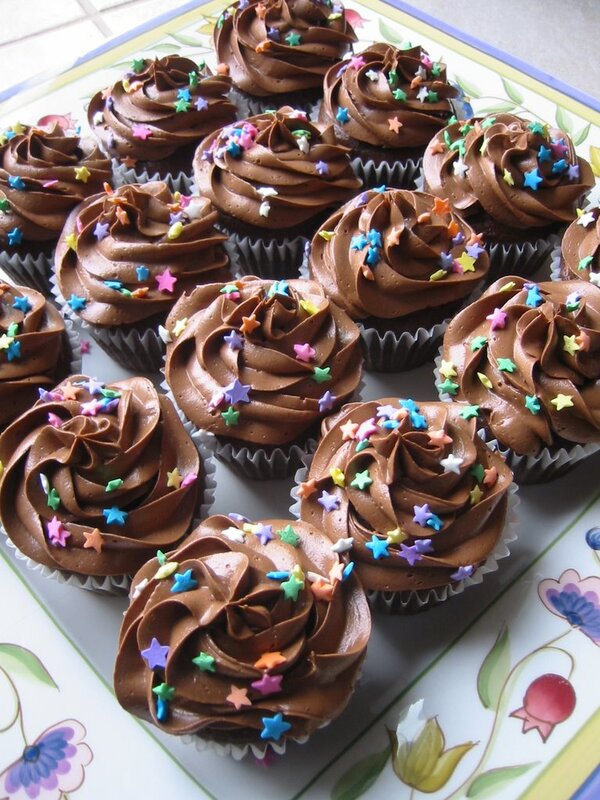 One of the easiest, kid-friendly desserts to make for a birthday party are cupcakes. My little neighbour, The Princess, just turned six recently and requested two desserts - white chocolate strawberry cake and chocolate cupcakes. Initally her mom was supposed to bake for the occasion but things got changed around and I was given the honour. 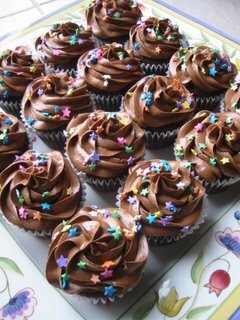 I love making cupcakes - they're easy and can be dressed up with some well-made icing and sugary star sprinkles. 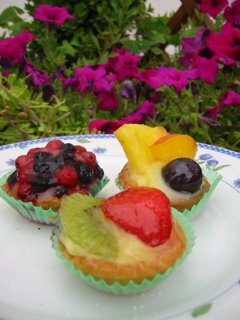 The cupcakes are not difficult to make and, as a bonus for some, don't require eggs. I think I posted a while back on a mix-in-the-pan cake and these are a variation on that theme. 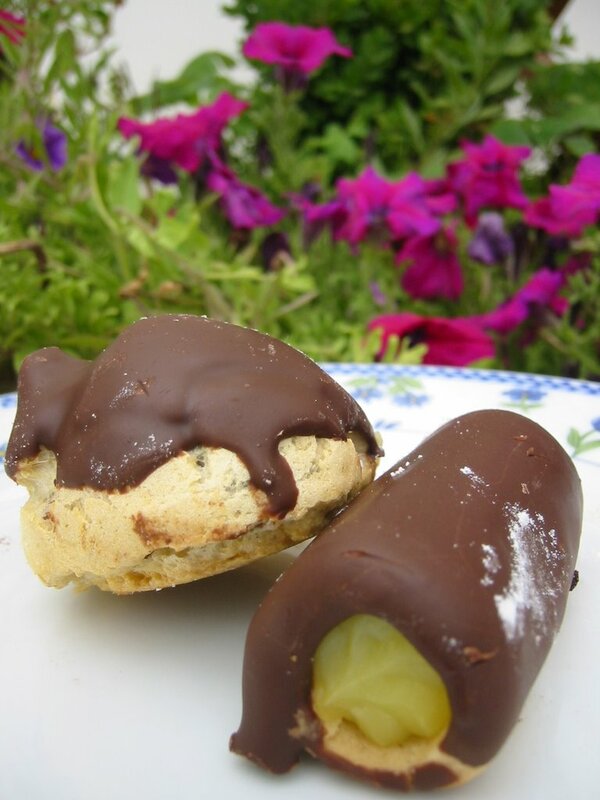 The recipe comes from The Clueless Baker and is super easy and very tasty. They baked up beautiful and airy and thankfully I made them all the same size. Using muffin liners allowed me to bake two batches back-to-back with minimal clean-up. The icing was also fun to make. The buttercream icing recipe comes from the Magnolia Bakery Cookbook and is not the usual type that requires 8 cups of icing sugar. After melting semi-sweet chocolate, you beat it into softened unsalted butter with only a little over a cup of sugar. The end result is heavenly - light and chocolaty. It was smooth and creamy and not too sweet. The kids liked it too - after the party many cupcakes were found with the icing completely licked off. All in all, they're a good bet for a crowd of sugar seekers and I'm happy everyone enjoyed them. The theme of SHF this month is Surprise Inside hosted by Alanna at A Veggie Adventure. The guidelines said you could use a surprise ingredient for your treat but I interpreted it quite literally - I wanted to make something with a surprise inside. 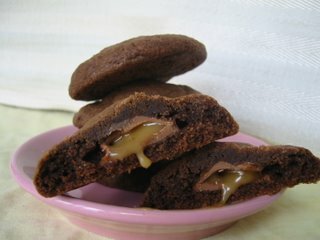 I decided to make Chocolate Caramel Cookies, a recipe I first tried years ago. I liked them but they were not my favourite. 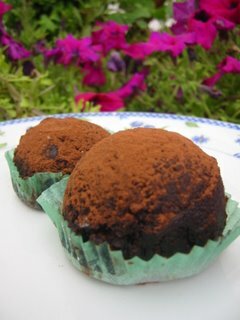 I gave them another try and made one adjustment by reducing the amount of cocoa powder and what a difference it made! Before, I thought the cookies were a little bitter but, with only 1/3 cup of cocoa powder, I got a fudgy, brownie-like cookie that surrounds a square of Caramilk bar. 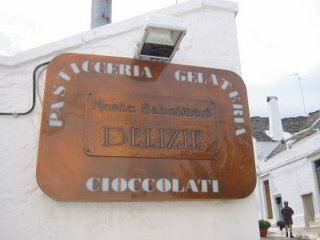 Straight from the oven, the caramel if gooey and warm and succeptible to running down your chin. Once firm, as in the picture, the caramel still stays soft and the cookie is delectable as ever. They got the thumbs-up in my house and I would not hesitiate to make them again. Hopefully, I will have more to share next time! Thanks for hosting Alanna - your theme was truly original! While I was in England visiting my sister, she showed me a bakery that was very close to her house. 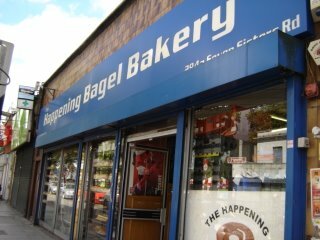 The Happening Bagel Bakery doesn't look like much from the outside but there are many treats to be had once you're inside. 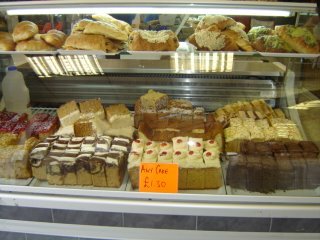 I saw mounds of fresh bread, savoury pastries and no shortage of sweets including cakes and tarts. We bought some spinach and cheese turnovers for lunch (which were very tasty) and said we'd return in the evening to pick up something to have with tea. 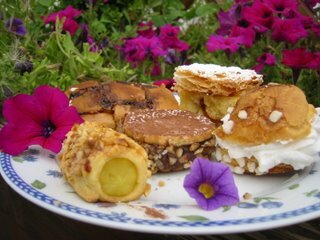 Unfortunately, we never did get a chance to go back so I can't vouch for the for the pastries but I'm sure they were very yummy as well. Until I go back to Finsbury Park, I'll just have to look at my pictures and hope my sister goes there ver y often! 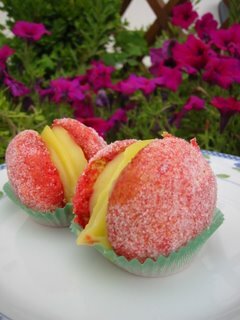 With all the delicious Ontario peaches in the stores these days, its almost impossible to buy a basket and have any left over to make into something sweet. I really wanted to try them out in a baked good so I found a simple peach cobbler recipe that I could put together quickly before the peaches disappeared. The recipe is super simple and very basic. The most time consuming part of the process is peeling the peaches which I did by plunging in hot water for 30 seconds. If you take the time to do this, the skin will come off very easily. You can add some flavouring to the peaches or cobbler - cinnamon and ginger may be good flavours to try. You could even throw in some berries for more colour. I didn't add anything to my cobbler and the dessert was yummy. 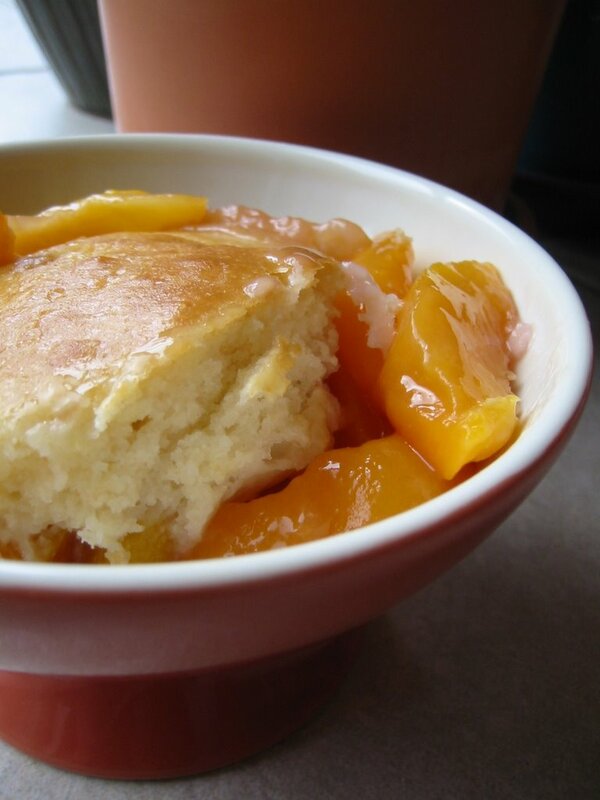 Warm, soft juicy peaches in a not-too-sweet sauce topped with light biscuits. To make it extra special, try topping with a scoop of vanilla ice cream, gelato or frozen yogurt. It was homey and satisfying all at once and tasted great the next day for breakfast. 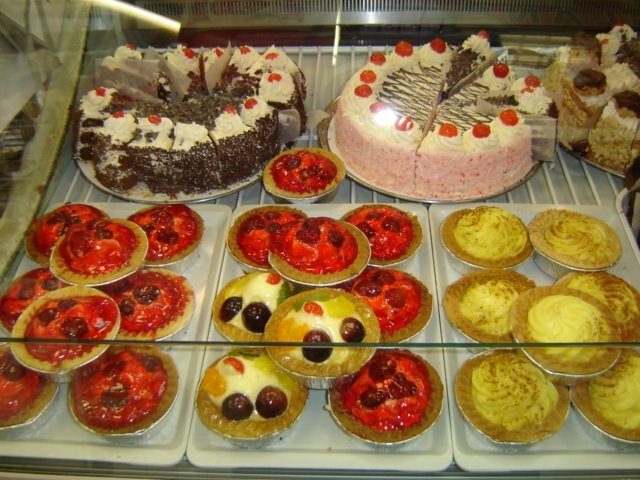 Before I left on my trip, I was excited about all the fanstastic desserts I would see and try. Upon arriving in Alberobello, I soon realized that I might not get to due to its size. 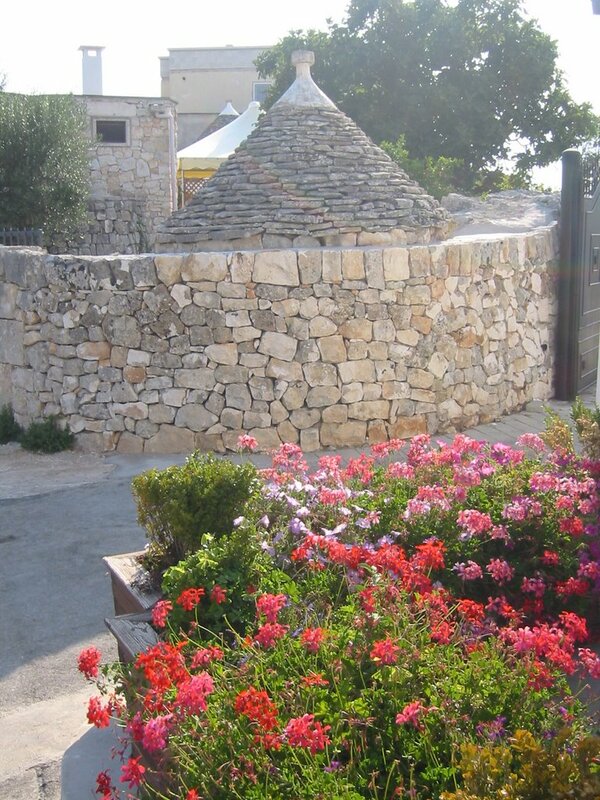 It is a very small, rustic city paved with cobblestones and numerous tourist stores selling replica trullis. 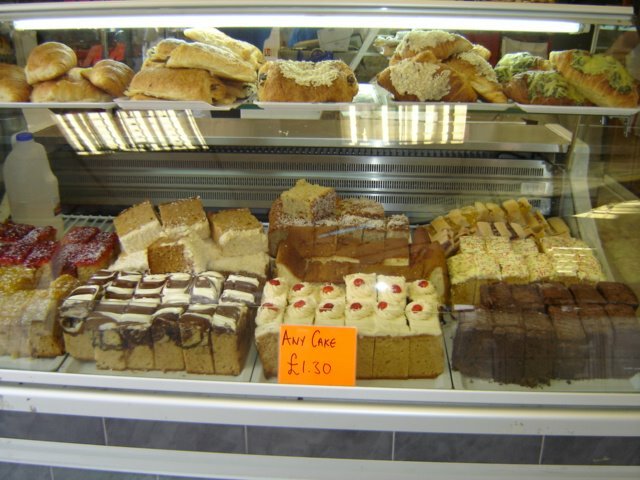 It was not until my sister-in-law Tanya said, "Did you see the great bakery in town?" that I had a glimmer of hope. I asked her to take me there next time we were in town. 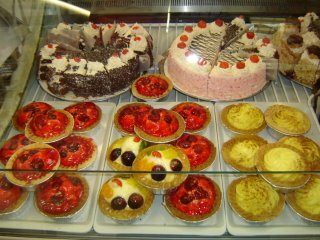 When we got there I was excited - they sold pastries, cookies, chocolate and gel ato. Everything (except gelato) was sold by weight so I pulled out 10 euros and said to give me an assortment. Well, 10 euros bought an entire tray of tarts, cream-filled pastries and cakes. We couldn't believe what she gave us so we bought some gelato and took our treats back home. They all looked very pretty, some more than others. The same went with the flavour - some were very tasty and some tasted like "cake and cream". 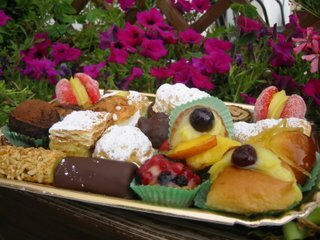 A few of these same pastries were served at the wedding, along with full slices of cakes and tarts so I think they are pretty common in the region of Italy that we were in. Yum! 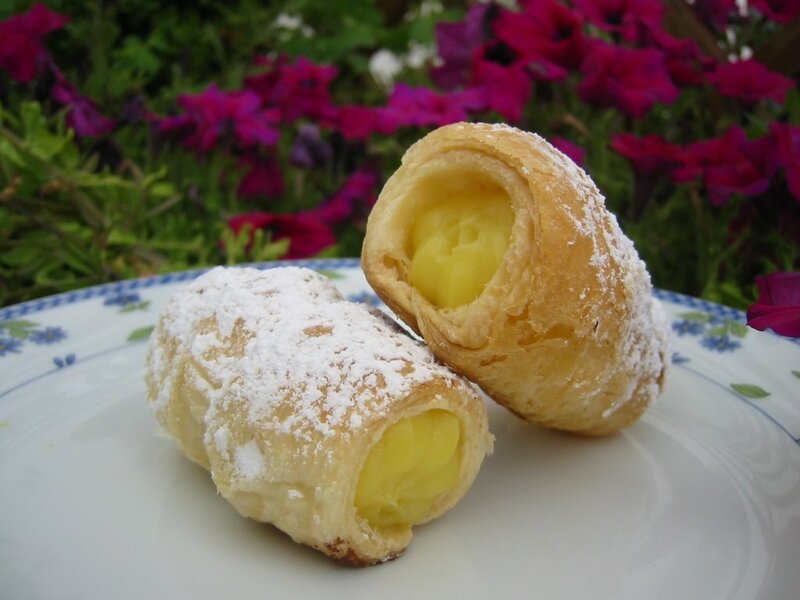 One of my favourite pastries (not shown) was shaped liked a croissant, glazed and filled with Nutella. Nutella! How fantastic is that? Two weeks sure do go by fast! 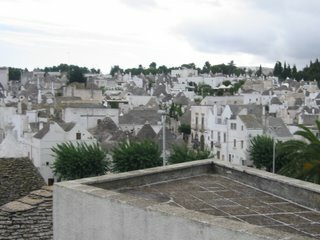 I'm back from Italy where my family and I spent time in the Puglia region of Italy, specifically Alberobello. This great old city is the home of the trulli, a dwelling with a conical roof as in the picture to the left. We had a great time trying to talk to the locals, who were always ready and willing to help us with pronunciation, ate lots of gelato and had fun in the sun. There were fruit and olive orchards everywhere. You could literally hop the stone fence and grab a fresh plum off the tree. Also, the mozzarella in Italy was to die for and makes the stuff we eat here seem like rubber. It was delicious and soft. The end of the trip was highlighted with a grand wedding at the Giardino del Mago in Canosa. We were treated to a seven-course meal, dancing and spectacular fireworks. (Pictures of the dessert table at the wedding will come later.) All in all it was a great holiday and I think I now officially have caught the travel bug! Who couldn't love a country that holds official festivals for Nutella?